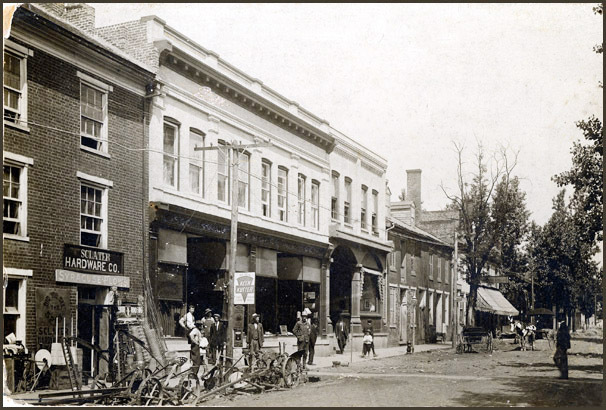 By 1915, Sclater Hardware had relocated to the north entrance of Traveler's Rest Hotel on Main Street in Scottsville. Both Sclater brothers also were active musicians in the Scottsville Band, as Nathaniel played a trombone and Wirt, a baritone horn. 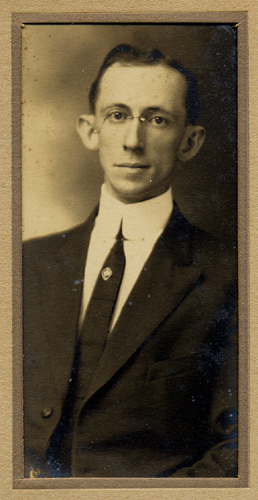 Nathaniel T. Sclater was born on May 10, 1879, in Cartersville, Cumberland Co., VA, and he was the son of Richard D. Sclater and Virginia (Walton) Sclater. By 1900, Nathaniel was living in Albemarle Co., Virginia, and he married Ellen Massie Boyd on October 15, 1900, in Albemarle Co. N. T. Sclater appeared in the City Directory of Charlottesville as residing in Scottsville, VA, through 1934 and involved with the local business, Sclater Hardware Co. Nathaniel was divorced from his wife, Ellen B. Sclater, on February 16, 1933, in Albemarle County, VA.
On July 1, 1939, Nathaniel T. Sclater married Anna Moylin Moon Sams (1883-1968) in Warrenton, Fauquier Co., VA; Anna was the daughter of James Nelson Moon and Cary (Coleman) Moon of Scottsville, VA. On the Certificate of Marriage, Nathaniel listed his occupation as 'Real Estate' and his residence as Takoma Park, MD. 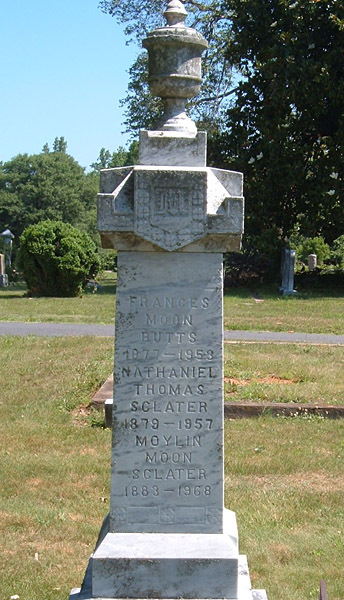 Nathaniel Thomas Sclater passed away in May 1957 in Polk, Florida, and he is buried at Scottsville Cemetery beside his wife, Anna Moylin Moon Sclater, and her sister, Frances Moon Butts (1877-1958). 1. Sketches of The Moon and Barclay Families Including the Harris, Moorman, Johnson, Appling Families compiled by Anna Mary Moon, Chattanooga, Tennessee, November, 1938; p. 25-26. 2. Virginia Divorce Records, 1918-2014, Virginia Department of Health, Richmond, VA; Decree 33-000226, Albemarle County, VA, dated Feb. 16,1933. 3. Virginia Marriages, 1936-2014, Virginia Department of Health, Richmond, VA; Certificate of Marriage # 22875, Fauquier Co., VA, dated July 1, 1939. 4. U.S. World War I Draft Registration Cards, 1917-1918, Washington, DC; Nathaniel Thomas Sclater, Scottsville, VA; SN: 3741; Order No. : 3182; dated Sept. 12, 1918. 5. U.S. World War II Draft Registration Cards, 1942, Washington, DC; Nathaniel Thomas Sclater, Washington, DC; SN: 269. 6. 1880 U.S. Federal Census, Hamilton Magisterial District, Cumberland Co., VA; Enumeration District 76, Dwelling: 1979, 14 June 1880, p. 11A.